(Nanowerk News) In the film The Martian, Matt Damon’s character survives being stranded on another planet by growing potatoes in his own faeces. And if we want to visit or maybe even settle on other planets for real, we’ll have to find a way to grow plants outside the safe environment of the Earth. On long space voyages in particular, plants will provide a vital source of food and oxygen. That’s why Tim Peake, the UK astronaut who recently returned from the International Space Station, spent some of his time in space working on an experiment to study plants. And it turns out that a single molecule that also plays a big role in making sure plants grow on Earth, could be key to understanding how to make interstellar greenhouses successful. Plants have actually been grown in space for a long time. In 1982, Soviet cosmonauts on board the Salyut 7 space station nurtured some thale cress, Arabidopsis thaliana, making it the first plant to produce flower and seed in space. Since then scientists have developed special growth chambers to grow vegetables and fruits in space with the right temperature and atmosphere. The problem is that plants don’t grow as well in space as on Earth, and the reason seems to be the effects of growing them in almost zero gravity. Plants are able to use the pull of the Earth’s gravity to know which way is down and grow their root in that direction and send their shoot in the opposite direction (an ability known as gravitropism). One way they do this is by using special gravity-sensing cells that contain starch-packed compartments called amyloplasts. Due to the high amount of starch in these amyloplasts, they are heavier than the rest of the cells so they sink to the bottom. In the weightlessness of space, the amyloplasts do not sink so plants lose some of their ability to perceive gravity. However, that’s not the only way they work out which way is up or down. Earth experiments have shown that even plants with starchless amyloplasts, which don’t allow them to detect gravity, can still display good levels of gravitropism. 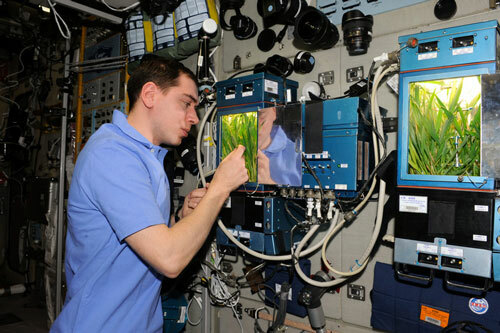 Similarly in microgravity, plants can detect light (phototropism) and water (hydrotropism) to work out where to grow. So we need to better understand how the lack of gravity affects plant growth. One possibility is that it all comes down to the plant growth hormone known as indole-3-acetic acid or “auxin”. This remarkable molecule is about a thousand times smaller than a dust particle but influences almost every stage of a plant’s life cycle, from germination to death. In my view, auxin is one of the most important small molecules that feeds the world. The effects of auxin have been studied for over 100 years by scientists including Charles Darwin and his son Francis Darwin. Plants regulate their growth by moving more auxin to the tip of the root and stem compared the rest of the plant. This uneven auxin level inside roots and stems is known as “auxin polarity”. Whenever plants detect a change in light, water or gravity they can transport auxin to adjust auxin polarity. This enables the shoot to grow towards light and the roots towards gravity and water. Scientists have shown that, in space, water can be used to replace some of the effects of gravity as the signal that influences auxin polarity. My own research has looked at a small molecule called 'TENin1' that interferes with auxin transport (Biochemical Journal, "Trafficking modulator TENin1 inhibits endocytosis, causes endomembrane protein accumulation at the pre-vacuolar compartment and impairs gravitropic response in Arabidopsis thaliana"). TENin1 causes changes in auxin polarity and removes a plant’s ability to detect gravity. Other studies in space have shown that gravity-related characteristics rely more on auxin than a plant’s ability to sense gravity ("P-chlorophenoxyisobutyric acid impairs auxin response for gravity-regulated peg formation in cucumber (Cucumis sativus) seedlings."). These results suggest that auxin transport and signalling are more important than gravity in influencing growth in plants. So to find the optimum conditions for plant growth in space, scientists are now focusing on how auxin is transported in microgravity. For example, one group is investigating how microgravity affects the cellular distribution of auxin transporters in cucumber plants. We still need to investigate how plants deal with cosmic radiation and the soils of other planets if we want to take them into space. But knowing how to grow plants in microgravity will make us more equipped for longer space expeditions and future space colonisation. And by improving our understanding of the way plants grow in general, it could even help us to boost agricultural production here on Earth.